Why Do High Quality Vendors Partner with Gorilla Spares? Many spare parts vendors have amazing products but typically do not have the time, know-how or resources available to develop a viable and sustainable ecommerce sales platform. Many end-users are searching for quality products online but do not know who is reputable or trust-worthy. A nice-looking website no longer means a quality product or reputable vendor. Both vendors and end-users have tried the big box auction and sales sites. These sites have produced mixed results due to unreliable feedback systems, unpredictable product quality, lack of technical / warranty support and unreliable delivery times. Listing cost for products on auction houses can easily exceed 15%-20% in total fees. This is much higher than the standard cost of doing business through traditional sales channels. Gorilla Spares solves these problems by acting as a bridge between high quality vendors and the end-users that are searching online for their products. End users trust Gorilla Spares to audit, qualify and partner with reputable vendors while ensuring they have outstanding workmanship and customer service. Vendors rely on Gorilla Spares to provide a low-cost, maintenance-free ecommerce platform for their products that is viable and sustainable. In addition, Gorilla Spares exposes vendor’s products to clients and markets that may not found them through traditional business-to-business sales and distribution channels. 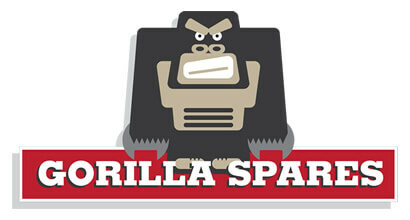 Gorilla Spares Partner Selection Process. one-on-one interview process with the Gorilla Spares leadership team. market research to ensure they have a reputation for high quality parts and customer service. on-site audit of their facility, quality system, inventory and testing process. Once all criteria are met, only the best products will be listed on GorillaSpares.com and with the promise that these items are in stock & ready to ship for fast delivery to the end-user. What is The Cost to List Products on GorillaSpares.com? The pricing structure is simple, transparent and has little-to-no cost until product actually sells on our site. Our fees are much lower than traditional auction houses or big-box consumer sites. Our hope is to retain great vendor partnerships for many years so our fees actually decrease as products are sold on our site. Check out some of our Partner Vendors below.